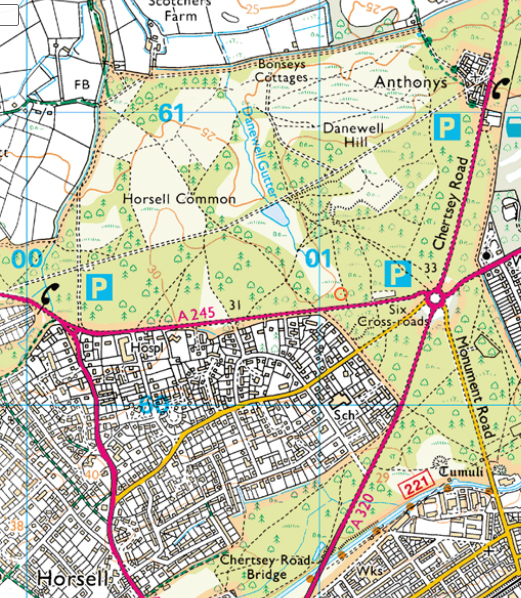 Map of Horsell Common. The common also has three Bronze Age barrows which are scheduled ancient monuments protected by law, as well as a Muslim Burial Ground which dates back to the First World War. In the 1890s, Horsell, in the lower left, was a small village of no more than 50 houses. To the north of the modern town of Woking in Surrey, England, is the village of Horsell, and to the north of Horsell is Horsell Common. The common, which is mainly heathland with many areas of woodland, 355 hectares (880 acres) in area, is a Site of Special Scientific Interest. The Horsell Common Preservation Society has owned the common since 1966 and it is one of only a handful of privately owned areas of common land in England with public access. In 1895, the writer H G Wells, Herbert George Wells, moved with his wife to nearby Maybury Road in Woking, and there he wrote his classic science fiction novel The Wars of the Worlds. With his brother Frank, Wells had explored the lanes and paths of the surrounding countryside either walking or on their bicycles. The original idea for The War of the Worlds came from his brother during one of their outings, who pondered on what it might be like if alien beings were suddenly to descend on the scene and start attacking its inhabitants. The Wars of the Worlds was first serialised in 1897 and then published in book form in 1898. The novel tells of the landing of spacecraft from Mars and the wholesale destruction of London, and much of the countryside to the south, by Martians in heat-ray emitting tripod machines. The unnamed narrator, a middle-class writer of philosophical papers, lives in Maybury, and a sandpit on Horsell Common is used as the landing site for the Martian space craft. Horsell Common. Sand and gravel were extracted from the woodland areas of Horsell Common for many centuries, much of it used in the construction of local houses. Sand extraction ended in the 1960s and the remains of old sandpits, roughly in the centre of the common, can be seen today. At most terrestrial men fancied there might be other men upon Mars, perhaps inferior to themselves and ready to welcome a missionary enterprise. Yet across the gulf of space, minds that are to our minds as ours are to those of the beasts that perish, intellects vast and cool and unsympathetic, regarded this earth with envious eyes, and slowly and surely drew their plans against us. 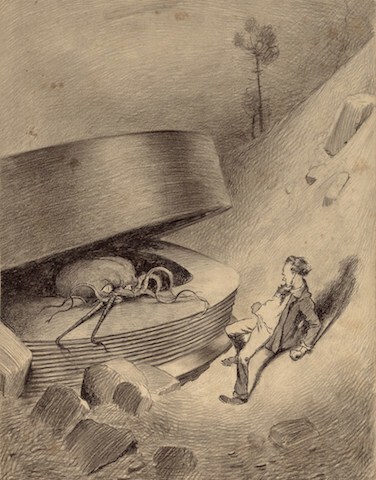 This illustration of the first Martian to emerge from the cylinder that had landed on Horsell Common, was one of 30 drawn by Henrique Alvim Corrêa and which appeared in the 1906 French translation of The War of the Worlds. But the very early in the morning poor Ogilvy [a well-known astronomer], who had seen the shooting-star and who was persuaded that a meteorite lay somewhere on the common between Horsell, Ottershaw [a village to the north of the common], and Woking, rose early with the idea of finding it. Find it he did, soon after dawn, and not far from the sand-pits. An enormous hole had been made by the impact of the projectile, and the sand and gravel had been flung violently in every direction over the heath, forming heaps visible a mile and a half away. The heather was on fire eastward, and a thin blue smoke rose against the dawn. 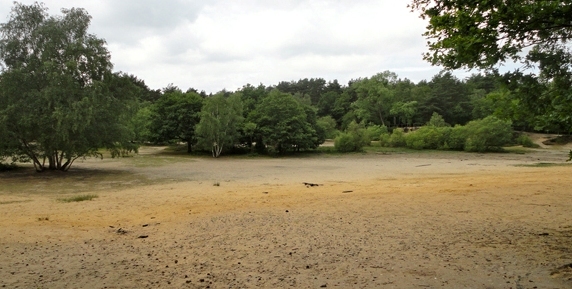 Today science fiction fans visit the sandpits on Horsell Common where H G Wells’ Martian spacecraft landed. In nearby Woking, a 23-foot tall Martian tripod, designed by Michael Condron, was erected in 1998 to mark the centenary of the publication of The War of the Worlds.